RAVENOL Frostlube F 12 is designed on the basis of specially selected base oils for the low-temperature performance and high quality hydraulic additives including corrosion and oxidation inhibitors as well as additives for the reduction of wear and foaming. RAVENOL Frostlube F 12 is a high quality, anti-wear hydraulic oil with a very high viscosity index, good shear stability and excellent low-temperature properties. 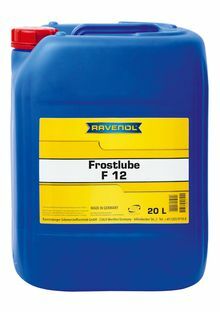 RAVENOL Frostlube F 12 is excellently suitable for application in extremely low temperatures, e.g. equipment in refrigerated warehouses or mobile facilities, which are used outdoors under extreme winter conditions. RAVENOL Frostlube F 12 is specifically formulated so that a consistent viscosity is extensively given even in the case of extremely varying temperatures. RAVENOL Frostlube F 12 is a shear stable, high quality hydraulic oil and therefore, suitable for application under extreme hydraulic conditions without risk for the system. If the oil temperature is permanently above 80°C, the hydraulic system should be pressurised to minimise oil loss due to evaporation. An extremely high viscosity index so that the good lubrication properties and the protection in the event of minimal viscosity alterations are ensured by a wide temperature range. A low pour point; therefore, application at extremely low temperatures is permitted without the risk of freezing. An extremely good resistance to oxidation and a very good shear stability; therefore, longer service life of the oil under the usually extreme application conditions. Protection of the hydraulic system against corrosive influences. Longer service life of the oil.